The Cowboys at Packers special teams preview looks at the kickoff and punt coverage units, the return teams, plus the kickers and the punters for both teams. After a thrilling win on Wild Card Weekend against the Lions, the Dallas Cowboys trek to Lambeau Field for a classic NFL Playoffs showdown against the Green Bay Packers in the 2015 NFL Divisional Round. 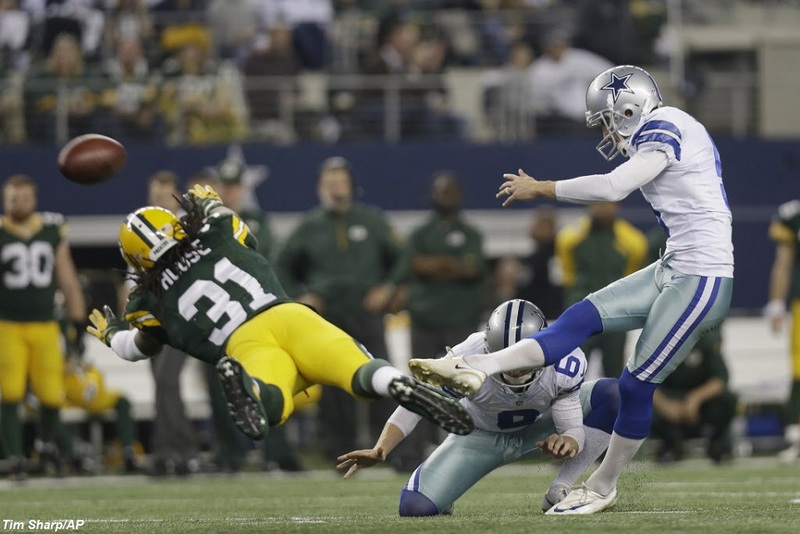 Dallas benefited from tremendous performances by its special teams units last weekend and aims to continue that trend. Meanwhile, Green Bay enters the game with questions on several of its units, most notably its punt team and placekicker. 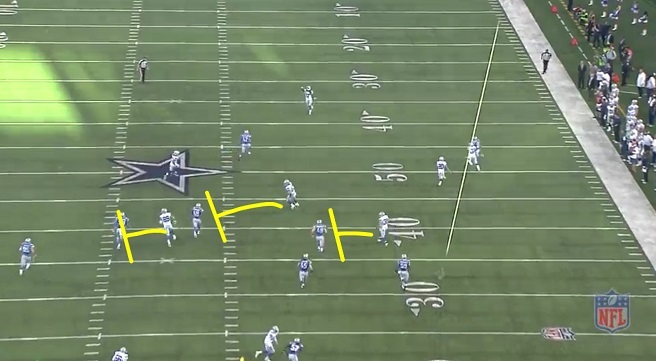 Those areas will be critical if the Cowboys are able to use their ball-control offense to keep the Green Bay offense off the field in this matchup. Chris Jones had an unremarkable season as the Dallas punter, ranking near the league marks in gross average (45.5 yards), kick rate inside the 20-yard line (46.8%) and fair catch percentage (26.3%). The only area Jones excelled in was touchback percentage, where his 3.5% rate ranked best in the league for teams with actual offenses (which excludes Oakland and Tampa Bay). 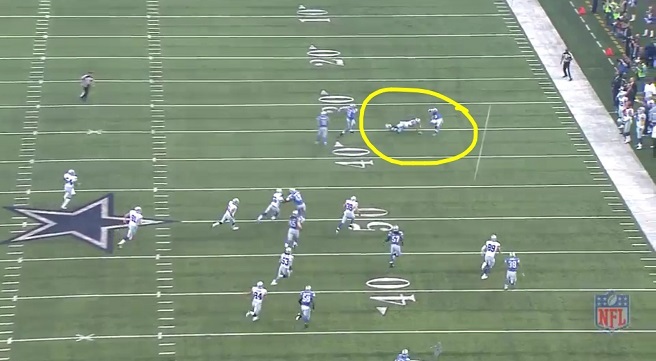 On this punt Jones boots it only 41 yards, but gets a terrific 4.6 seconds of hang time, allowing his gunner to get down the field and tackle Golden Tate after a two-yard gain. 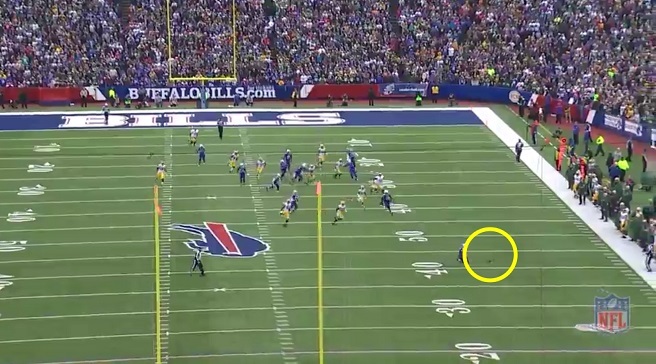 Here he blasts a 51-yard kick within five yards of the sideline, forcing a fair catch at the Detroit 11-yard line. 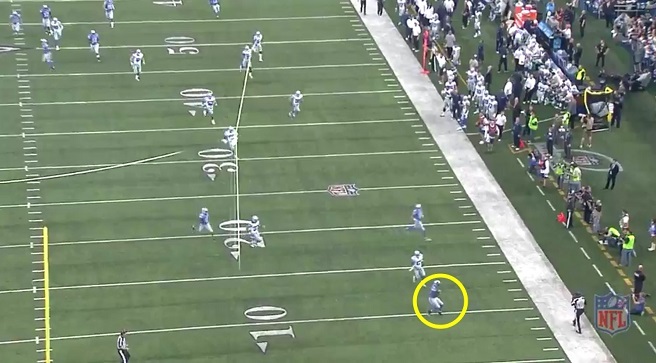 This was a phenomenal day for Jones, and his play was a major reason why the Cowboys were able to stay in the game despite their early struggles on offense. The battle for field position, and the positive effects of winning it, were clear in this game. Jones is unlikely to replicate this performance against the Packers, but for one day he was as good as it gets in the NFL. Dallas had a slightly below-average coverage unit this season, with their 9.6 yard average almost a full yard over the league mark. They will be challenged by a Green Bay return unit that has somehow brought two punts back for touchdowns despite appearing more interested in blocking kicks than setting up returns. 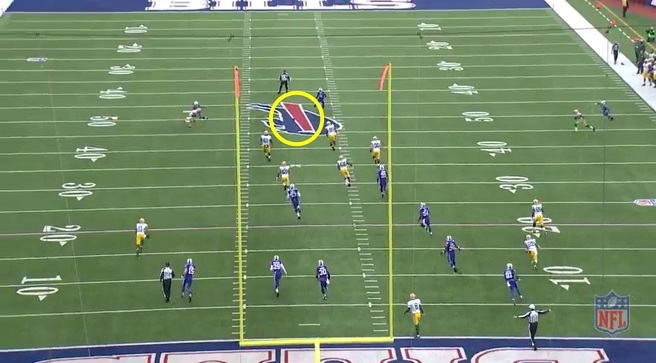 The first touchdown resulted from an apparent helmet malfunction on a Philadelphia defender, while the second came at the expense of a Detroit coverage unit that allowed Micah Hyde to run up the middle without laying a hand on him. These are clear cases where the outcomes were caused by poor defense rather than strong execution on the return. 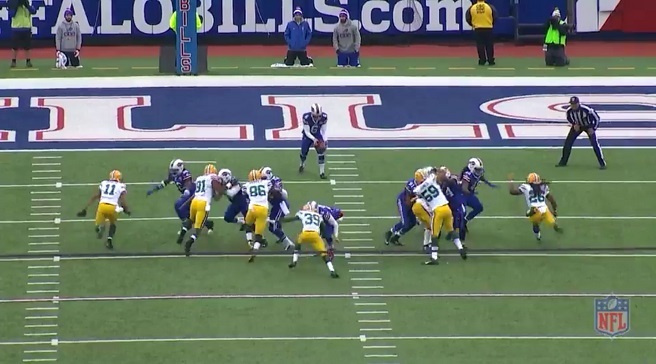 The Packers bring all seven rushers and once again come up just short of Schmidt. This is likely an even match between these two units, but Jones could be the difference-maker if he has a game similar to last weekend. Hyde, the Packer returner, has shown the ability to capitalize on opponent mistakes, but has been mediocre outside of his two touchdowns, averaging just 7.5 yards per return on his 12 other runbacks. 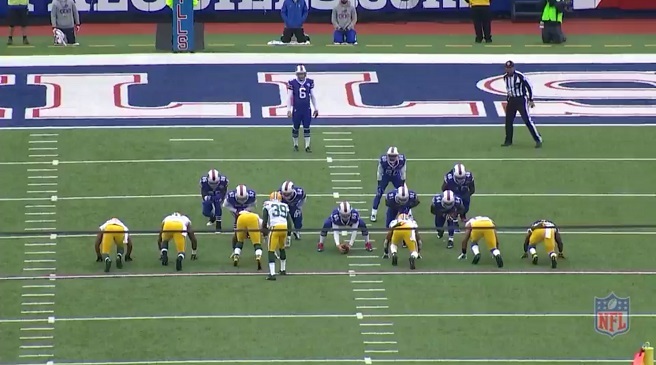 The Packers’ Tim Masthay is one of the worst punters in the league. His 44.1-yard average came in only a yard below the NFL mean, but his peripheral stats were atrocious. He landed only 28.6% of his kicks inside the 20-yard line compared to 34.6% for the league. His 20.4% fair catch rate put him 7.0% below the league average, and his 8.2% touchback rate eclipsed the NFL mark as well. 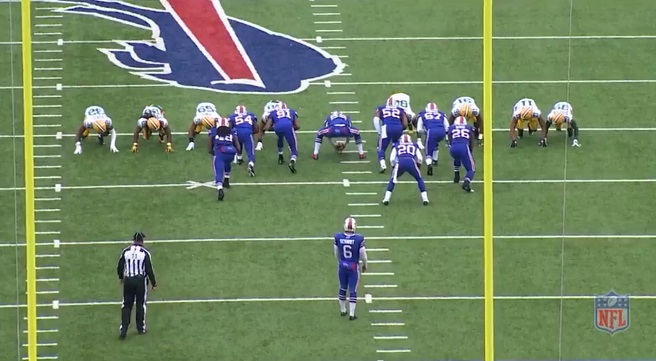 The Green Bay coverage unit is bunched in the middle of the field trying to cross over. Had the Buffalo returner fielded the punt cleanly, a significant amount of running room would have been ahead of him towards either sideline. Green Bay’s coverage unit rates average in stopping returns, but they have a problem even getting to that point – they tied for the most punts blocked in the regular season with two. This unit should not fill Packer fans with optimism and, in a tightly fought game, could be a major issue for Green Bay. 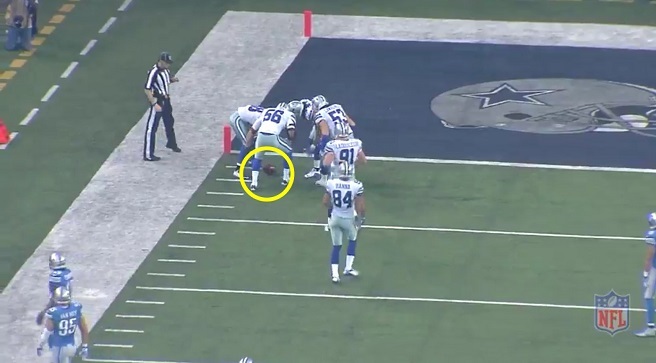 Above, three Cowboys attempt to seal off their blocks to the left, creating a lane up the right side of the field. This is not a wall return, which relies on a solid line of blockers, but rather a simple strategy that gives a returner multiple cuts to choose from throughout his return. It typically does not offer the same potential benefit as a wall return, but sets up for more consistent blocking if the ball is kicked directionally. The Cowboys’ Dwayne Harris averaged 9.2 yards per return, tying him for ninth in the league. Harris has not scored a touchdown this year, but is a competent returner who seems to always get positive yardage. 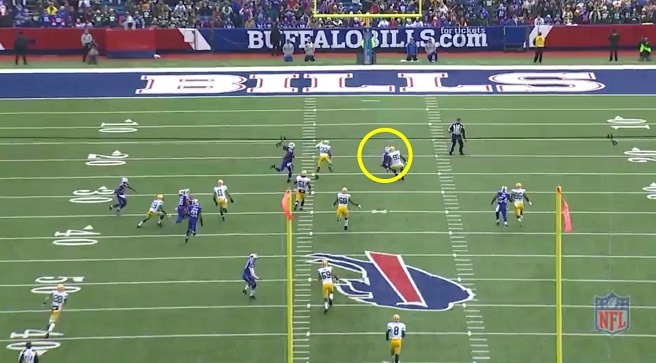 He should have ample opportunity to make a difference against a weak Green Bay punt team. Dan Bailey was impressive against the Lions, mashing four of his five kicks for touchbacks, with the remaining kick still landing three yards deep in the end zone. Much like Jones, his day rated significantly better than his regular season numbers, as he hit only 55.3% of his kicks for touchbacks in 2014. He will likely face greater challenges at cold and windy Lambeau Field, with his numbers likely to regress due to those conditions. The Dallas kickoff coverage is outstanding, allowing only 21.5 yards per return in the regular season compared to the league average of 23.8. Green Bay’s return unit ranks 2nd-worst in the league, accumulating only 19.1 yards per return. Much like the New England Patriots, the Packer return unit exists solely to get the ball in the hands of Aaron Rodgers. Little more is expected, and little more is delivered. Mason Crosby struggles getting the ball into the end zone on kickoffs, whether due to kicking conditions or leg strength. His 42.3% touchback rate ranks 6th-worst among kickers and, with cold conditions expected on Sunday, this is likely to continue. The Green Bay coverage team is slightly below-average, giving up 24.6 yards per return. The consistently unspectacular Dallas return squad ranked 13th in the league with 23.9 yards per return, with a season-best runback of 42 yards. Harris is the primary returner for the Cowboys, tasked with retaining possession for the Dallas ball-control offense this weekend. Bailey ranked 14th in the league with 86.2% accuracy on the season. He has a big leg and showed better consistency in 2012 and 2013, when he surpassed 90% accuracy in both years. He is a capable kicker who should prove to be an asset in the tough Lambeau Field environment. Crosby has never lived up to the hype that followed him from the University of Colorado. The two-time NCAA All-American has struggled in the NFL, compiling a career accuracy of just 79.1%. He has been slightly better this year, making 81.8% of his kicks, but struggles from all distances and is not a reliable scoring option. The Packers are at a clear disadvantage here if the Cowboy defense holds them to field goal attempts. The Cowboys rate merely average in most special teams phases, but sufficient to give them the edge against some underachieving Packer units. Jones and Bailey were both at the top of their games last week, and similar performances could mean trouble for Green Bay, especially with Aaron Rodgers not at full-strength.